Many moons ago, one of the raisons d’etre of the original Convivium site was to make some of the original Knizia titles more accessible to the non German-speaking world. These days, sites like boardgamegeek.com proliferate and publishers produce game rules in multiple languages. The translations presented here are derived from the original games – most are now out of print, or have resurfaced in different editions. But if you do come across a second-hand copy, then we hope you will find this page still useful. The devilish fast-paced card game of wordmaking from common letter combinations. The tactical card game of balancing your resources. He who loses, loses; but then he who wins also loses! The horse racing betting game. A card game of keeping up appearances – but will the cost be too high? A cunning race game – try too hard to get to the honey and you’ll help your opponents more than you! A tactical game of building development set in Hong Kong. The cool cats of the feline blues bars vie with each other to earn the most… mice! Adventure and questing in the court of King Arthur. Can your become the King’s first knight? The fleamarket trading and collecting (memory and dice) game, starring Benjamin Blümchen. Can you demonstrate your superior club-ability by predicting the outcome of five sporting bets? There’s a whole heap of trouble in the garden, courtesy of troublesome burrowing creatures. It’s gardener vs. pesky mole madness! 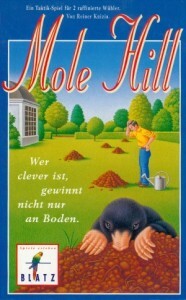 W & L Verlag Germany, 1999. The ultimate placement and tactics game – no theme required! A devious game of lining up against the opposition – to get the best sheep pastures. Two druids square up against each other in the contest to be master of the stones. A tactical game for two cool heads. Players vie with their knights to secure the most estates. The family game of making classic Hollywood movies. Original copies included a CD of famous movie songs. On more recent editions, the name of game has been changed, the box artwork slightly altered, and the bonus ‘soundtrack’ CD dropped. A tactical cardgame… score nothing and you’re a winner!